Keep extra ammo handy at all times and stash it wherever makes sense on your gear or your person. 5ive Star Gear's M.O.L.L.E. Compatible 9MM 2-Mag Pouch is crafted using tough and sturdy nylon material that is durable under the rough and tumble conditions of daily usage. The mag pouch features a snap closure to keep your 9mm magazines securely in place, and it will interface with any MOLLE webbing system so you can configure the carry of your gear in the way you choose. 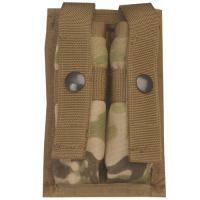 5ive Star Gear is in compliance with GSA requirements for this pouch.